First, an apology. As the title suggests, this trip was not a normal, scheduled event and my official photographer was not present. Check websites for additional pictures. 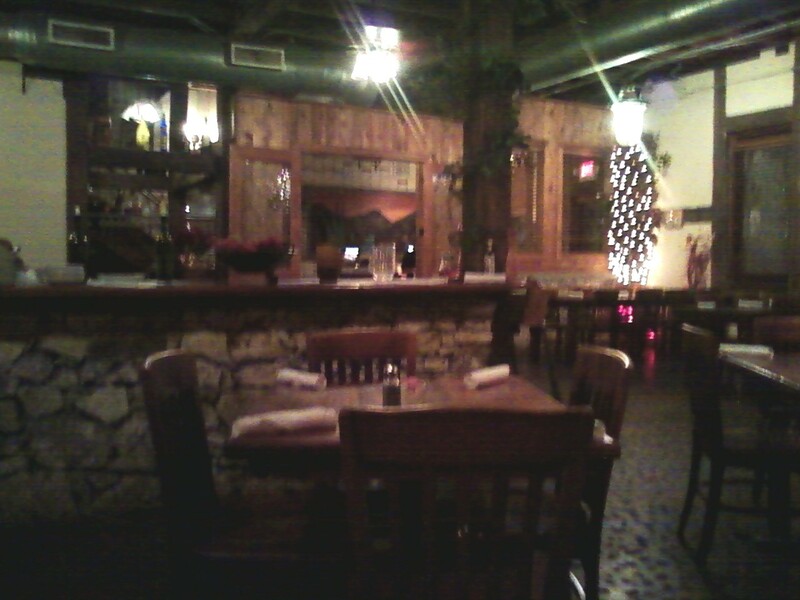 What originated as dinner in Dripping Springs with my sister turned into a delightful jaunt to multiple establishments. 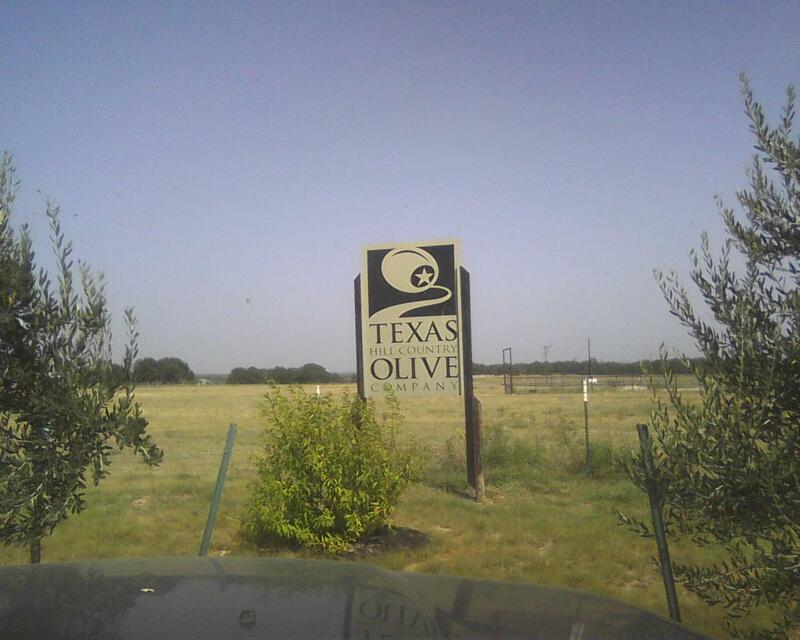 We began at the Texas Hill Country Olive Company. 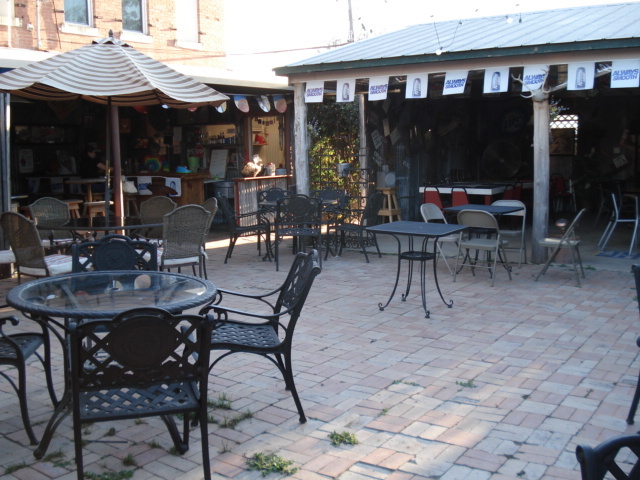 The building and patio are beautifully constructed, although the flow inside is a bit choppy. The counter area sports olive oils on one side, and balsamic vinegars on another. This area can get a bit crowded; it was difficult to determine organization. We noted to the ladies behind the counter, we wanted a tasting and shortly, another lady came out to give us the skinny. She also makes the bread for dipping and while not overly informative about the process and complexities, she did start us out nicely. Six olive oils, of which are internationally three award-winning. 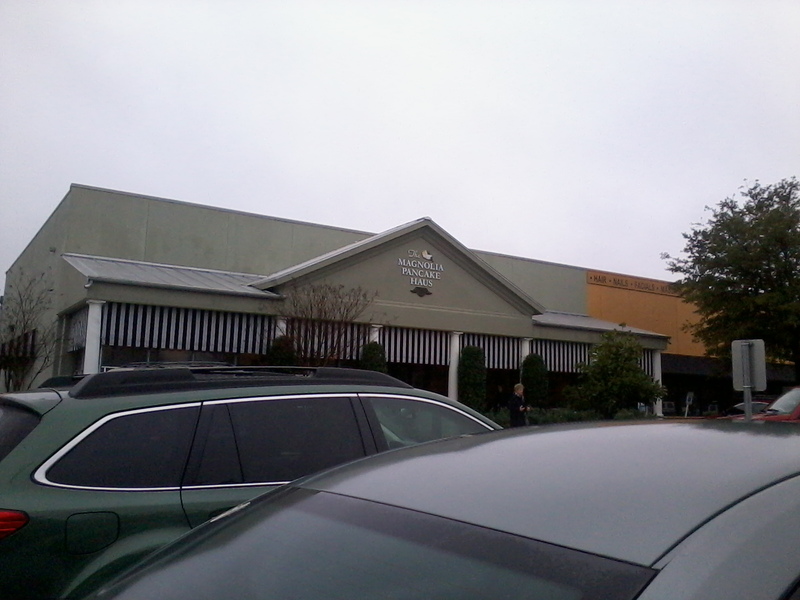 I purchased the jalapeno olive oil and fig balsamic vinegar. Also offered are wine and light food. One our way from the olive place, we saw the Bell Springs Winery and decided to swing in. 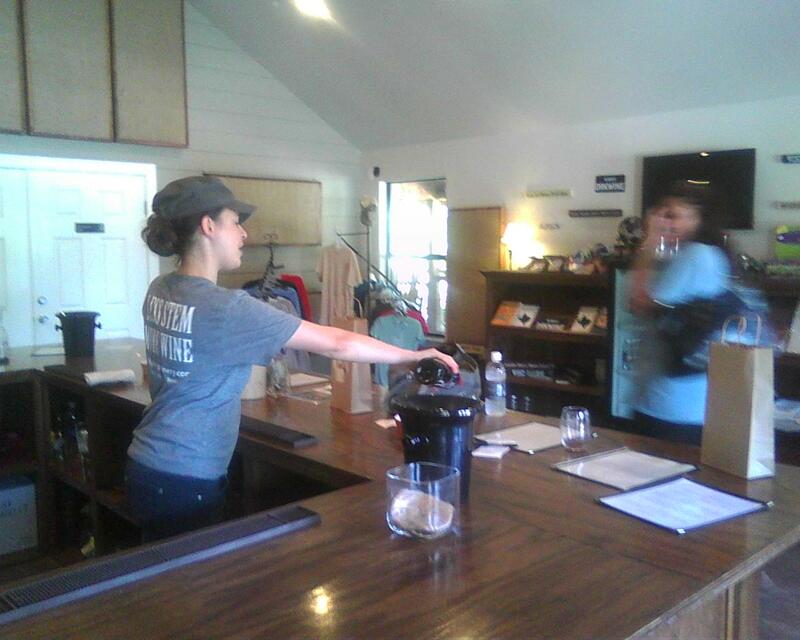 The tasting room is cozy and nicely organized; tasting was free if wine is purchased. Our sommelier was friendly, knowledgeable and kept us on track. Extreme spectrums were absent and all were palate pleasing. I bought a bottle of the Reston Wild West White. The name did have something to do with the decision. Admittedly, it was delightful to have the place to ourselves. 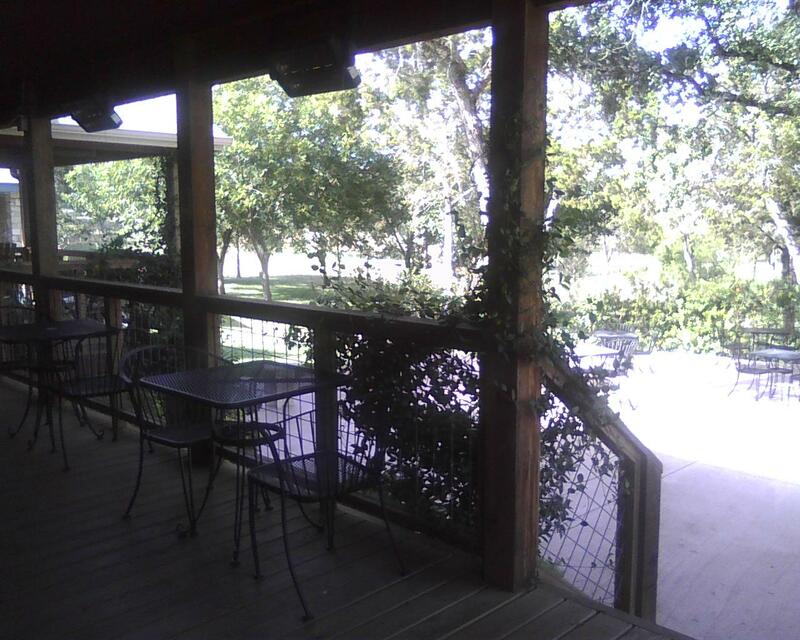 The facility has a lovely porch and patio surely ideal in all months not beginning with ‘A’. Upon recommendation, we dined at Cafe 131, a converted house which is much bigger than it seems on the outside. 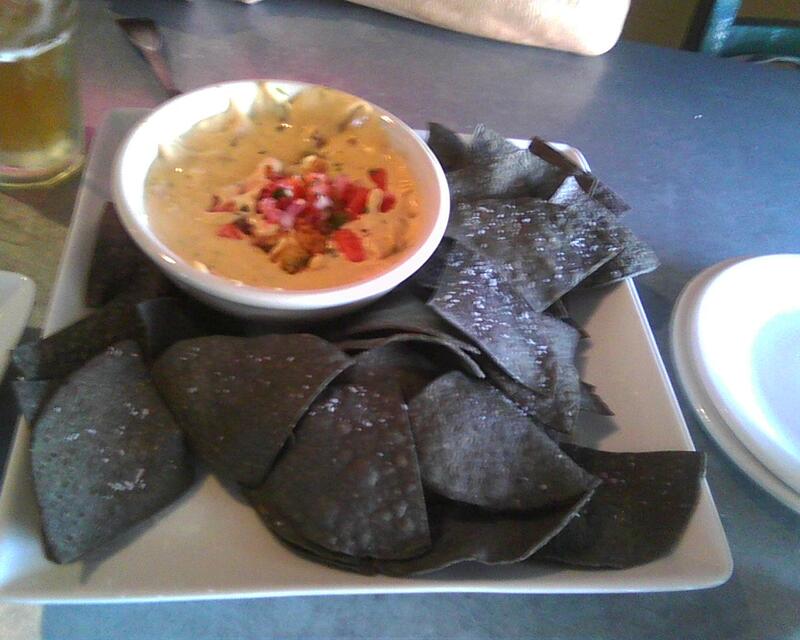 Starters included Drippin’ Mud, which is pico, fried avocado, queso and house chips. Thicker than typical queso and equally as addictive. 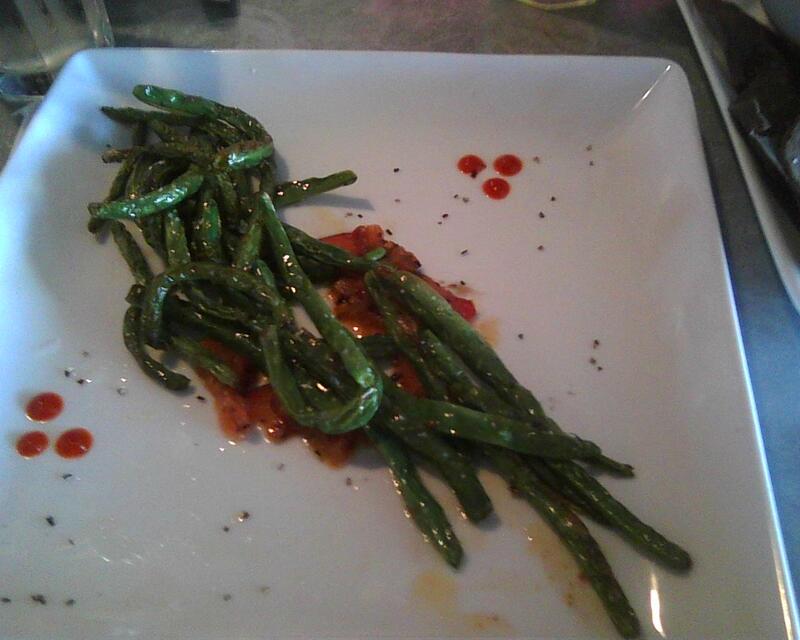 We also tried the Charred green beans with seasonal vegetables, maple syrup, sriracha, herbs and beet puree. While tasty, it would have benefited from a bit more heat. 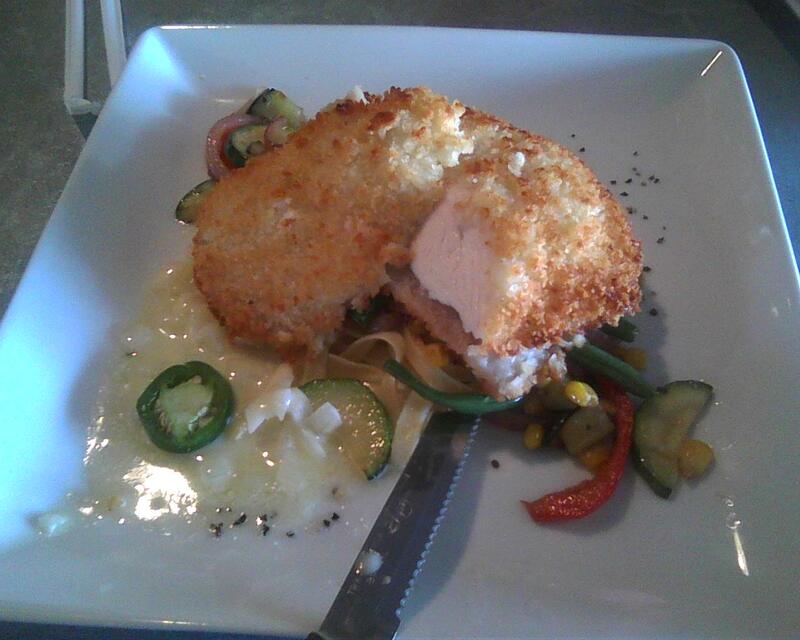 Overall, the star was the main course of Chicken schnitzel with citrus/jalapeno beurre blanc, panko (highly recommended alternative to bread crumbs) crusted chicken breast, fettuccini and market vegetables. It was light with a fresh summer taste; the fettuccini tied it together well. Next, we migrated to the other side of Mercer Street to The Barber Shop, less for haircuts, more for beer. 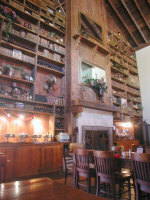 Located in a great rock building from 1924, the selection of brews is extensive. Shout out to Tank 7! Covered patio outside with misters and fans, dogs allowed. No pics, as I started talking and waving my arms, and then lost track of three hours or so. Finally, we scuttled across the street to Mercer Street Dance Hall just in time to hear a couple of songs and not get charged cover. 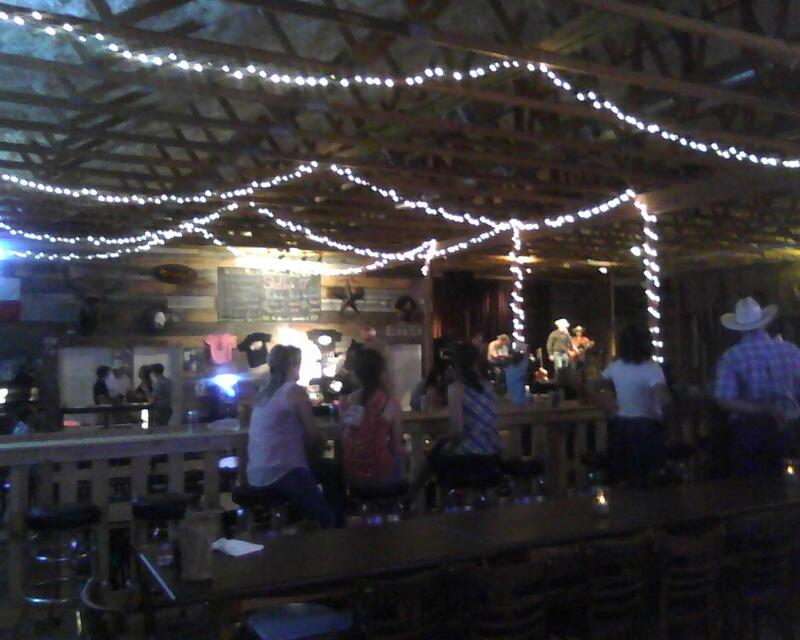 This place is BRAND SPANKING NEW, which is rare on the honky tonk circuit. Cash only, now outfitted with air conditioning, also has a great porch and backyard area. Staff was friendly and it looked like a good place to dance. Toying with taking another trip out this way to stay here for a while. Whew! Incredibly productive. Just a glimpse of Dripping Springs but I highly recommend roaming around. You just never know! Thanks to my sis, who had no idea what I was getting her into. The koala did it! Fact: Koala bear fingerprints are almost indistinguishable from human fingerprints. While I work on the posting about our trip to Dallas and Fort Worth, here is dining advice as procured from Gabe Sanchez at Black Swan Saloon. We haven’t been to these places yet but if his restaurant recommendations are anything like his infused drinks, you are in good hands. Listed by Dallas Neighborhood, Sub-Categoried by Joint Name and Food Style. Go try them and let me know! Trivia answer to a question you didn’t know you had: The ‘ZIP’ in ZIP Code stands for Zone Improvement Plan. 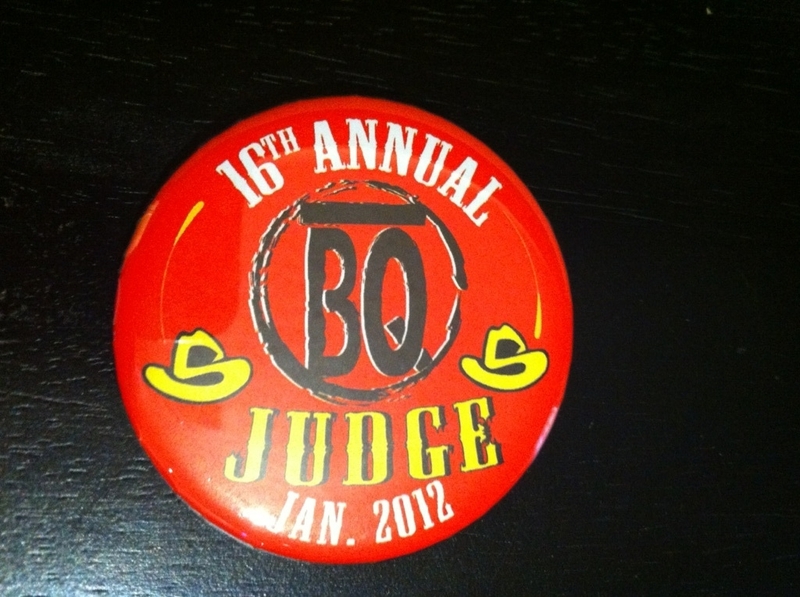 For the past two years, your very own HTF has been moonlighting as a BBQ judge. 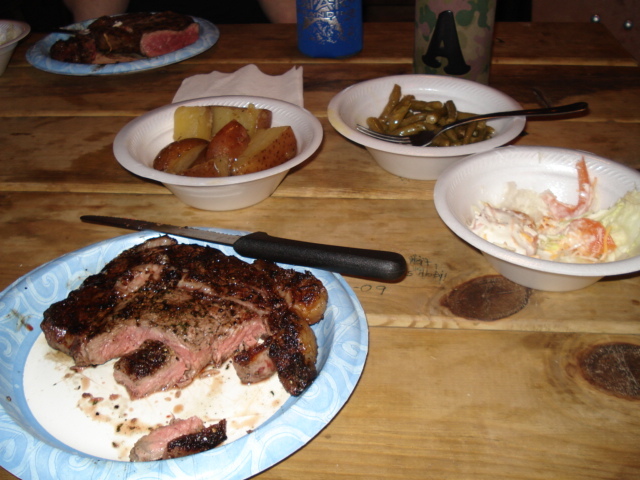 The first experience was at the San Antonio BBQ Cook-Off, reviewed here. Since then, I have picked up on a few things which might be helpful for anyone out there who participates in these types of things or has just been generally intrigued by the whole thing. Since I still claim to be no expert whatsoever, let’s name these the Seven Highly Recommended Suggestions (and Three Commandments for Judges). 1. Taste, texture, smell AND visual representation – Multiple things get reviewed. Utensil in hand, the lid is peeled off and BAM! There is the mighty First Impression, which is (completely unscientifically) calculated at 82% of the overall score. If it looks weird, it’s probably going to taste weird (even if it really doesn’t). Here’s a trick: put the food in the container that will get turned in. Set it to the side for about ten minutes. Sit down and open it. Look at it like it’s the first time. Then you will see what we judges do. Remember there is no ambiance for us, just a throwaway container and a scorecard. 2. Bacon is not your savior – Ok, bacon is delicious. I know this, you know this. And while bacon tends to put people in a happier place, it is not going to make the sun shine, the flowers bloom or your weirdly cooked meat the winner. There is no magic ingredient, so before you get all crazy and start slapping bacon around everything piece of shrimp, jalapeno and quail breast, just remember, the person next to you is probably doing the same. 3. Distractions – Just like in real life, under the judges tent, distractions are everywhere. Tables with chatty judges, MCs who wont stop spouting the rules over and over, saltine fatigue, water bloat and problematic toothpicks. Not to mention eyeballing the person before you to ensure they didn’t double dip their spoon or fork or worse, get all touchy touchy with their (gasp!) fingers. Make your entry a sound bite, something that is immediately interesting and tasty looking. 4. Now is not the time for experimentation – Know your audience. Most of the time, simple is good. Simple is also, surprisingly enough, not very common. 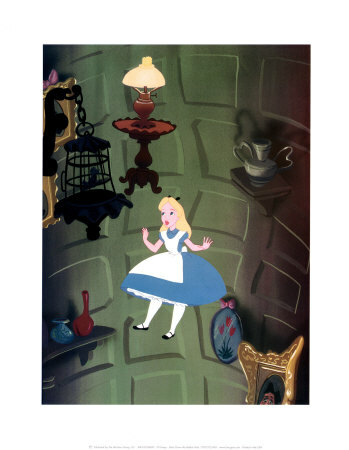 Everyone is boarding the crazy train to make themselves outstanding. But here’s the thing: the judges can not compare entries to one another, which means if it is just delicious, it will get a high score. Which will move you into the next round. I’m looking at you, Beans people. I had burned beans, super sweet beans, beans that smelled like Earl Grey tea and beans that had the color of a misty day. But if I had a beans with a little cilantro, onion and jalapeno, they would have received a score at least three points higher than any other. 5. Look for loopholes – The rules of each cook-off are a bit different. Be creative within the limits of the law. Sometimes a You Pick It category allows for dessert. Bust out something interesting! Now, this does not contradict the suggestion regarding experimentation. If you are doing a standard entry, try simple. If you are looking for wacky, make it good. 6. Think like a judge – Judges are only allowed one bite of an entry. That’s right, one little nibble of that delicacy of your blood, sweat and tears, delivered with kid gloves. So make each bite count. Better yet, tell us your best bites: cut up little pieces for us. All we get is plastic cutlery so ready-to-go selections allows for personal preference like middle or ends, instead of hacking away at a slab of meat just for a taste. 7. Don’t be the worst – Judges talk. Occasionally the really awesomes make an appearance in the exodus discussion but what we really go on and on about are the bad ones. Number 11 for beans, hello are you out there? Although you have no idea those beans were yours, let me tell you, they were TERRIBLE. Seriously bad. Burned, grey, leaving everyone at the table stumbling for a carrot and fresh bottle of water. Be noble and don’t submit burned food. 1. Don’t touch the food. Seriously, gross. 2. Stop talking. It is hard enough to factor multiple items of one bite of anything, score, cleanse a palate and wipe your memory. Your prattle is not helping. 3. Don’t be a jerkface. Judge an entry on its individual merit, not how you would have done it or like it. Remember, people work hard on this stuff and not just for the duration of the event. Keep those containers and green grapes coming! See you at the ***** Cook-Off! “The Evil Side of Orville Redenbacher” medical fact – Popcorn Lung is a really bad thing and could result in a lung transplant. 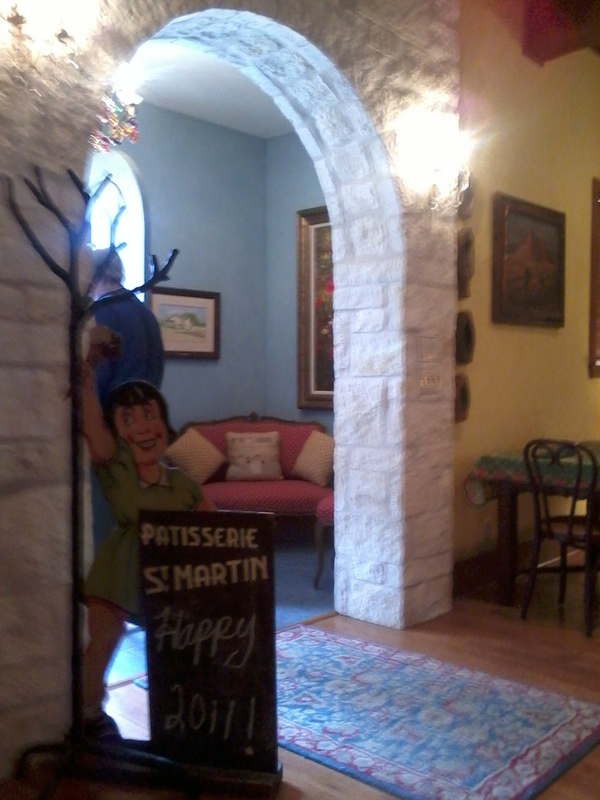 Spinelli’s Vistro Restaurant is on main street in Boerne, closer to I-10 than the HWY 46 bridge in town. Parking is a bit of a mystery; we parked on the street beside it. As this is also an event venue, there might be a lot but it was dark and we didn’t see one. Outside, the building is a mix of Hill Country rock with Alsatian woodwork. Inside is a mix between a German beer hall and down the rabbit hole. Now, I don’t always drink wine but I do have an unnatural amount of grey hair and expect to be provided a wine list, which the hostess did not give us. In fact, she actively skimmed over it to gather our menus and seat us. But our waiter was efficient without being pushy and provided easy recommendations. The menu is not extensive but has many good options. I was under the impression the place was Italian (maybe it was the ‘vistro’ thing) but was incorrect. 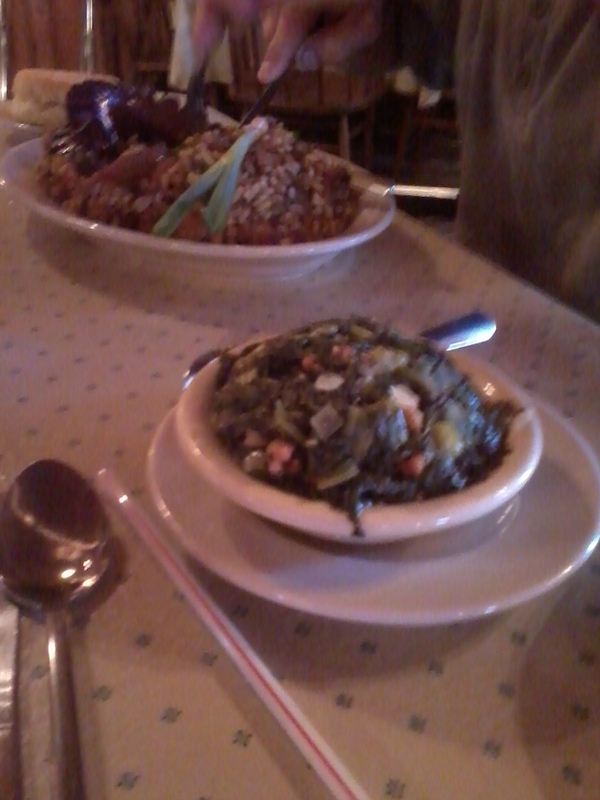 I ordered the Caribbean salad, hubs got the All You Can Eat Catfish. The grilled chicken, shrimp and pineapple were all cooked very well. Waiter’s pick of the Honey Italian dressing was spot on. The iceberg lettuce, however, was a big fat letdown. What is the point of having a nicely topped salad when its bedding is crystallized water? I would have gladly paid a couple more dollars for a nice spring mix with an ounce of nutritional value. C’est la vie. 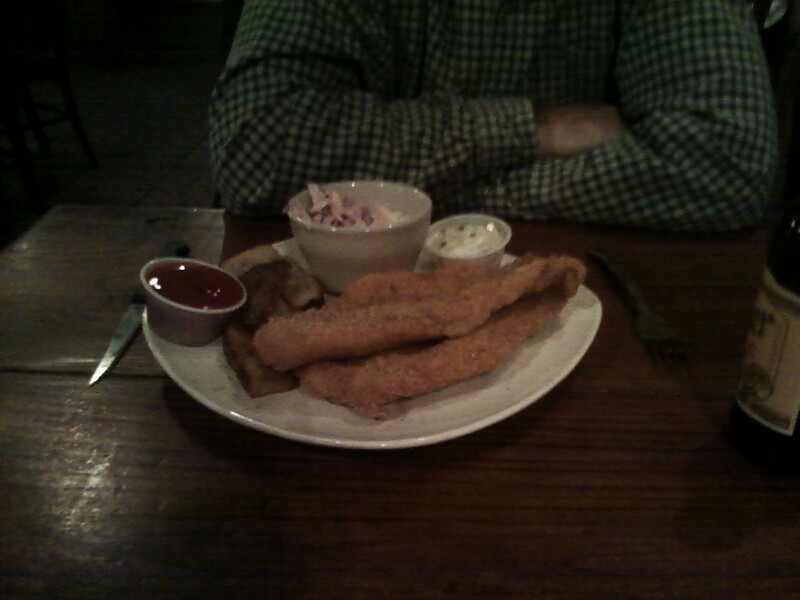 Catfish had a tasty breading which contributed to the flavor but did not overwhelm. The actual fish, however, was a bit undercooked. Edible but still a little translucent. Potato wedges and coleslaw were predictable but good. As previously mentioned, this place is an event venue and their attentions may be more on the catering/ hosting side. The wine options were well crafted and laid out on the menu for pairing. Also, it was the Friday before Christmas and they may have had a skeleton crew. Lick it up fact: Lollipops were invented around the Middle Ages. HTF is back. Where the hell are you? I am hitched, honeymooned and homesteading. Let’s get back to the basics of love, yall. Love of Honky Tonks and Food, of course! 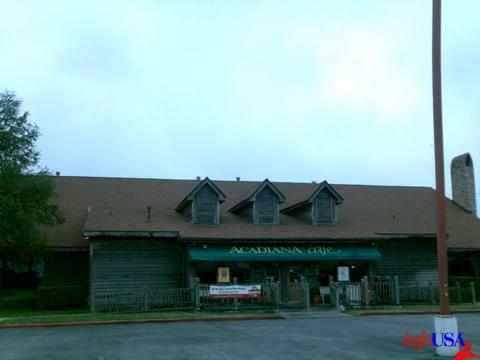 A couple of months ago, the hubs and I went to Acadiana Cafe, outside San Antonio. I have sampled their food a few times from a festival cart (yea, fried pickles) but have not been to the bricks and mortar place in a long, long time. Living in Louisiana for a year instilled a profound appreciation for Cajun food, although I am by NO means an expert, so bear with me. The place is quite large and setup for flow of many people and large groups. They serve beer, wine and margaritas; Abita was a nice touch. Service was a little sluggish but attentive. About six tables were occupied when we were there, so it could go either way when busy. 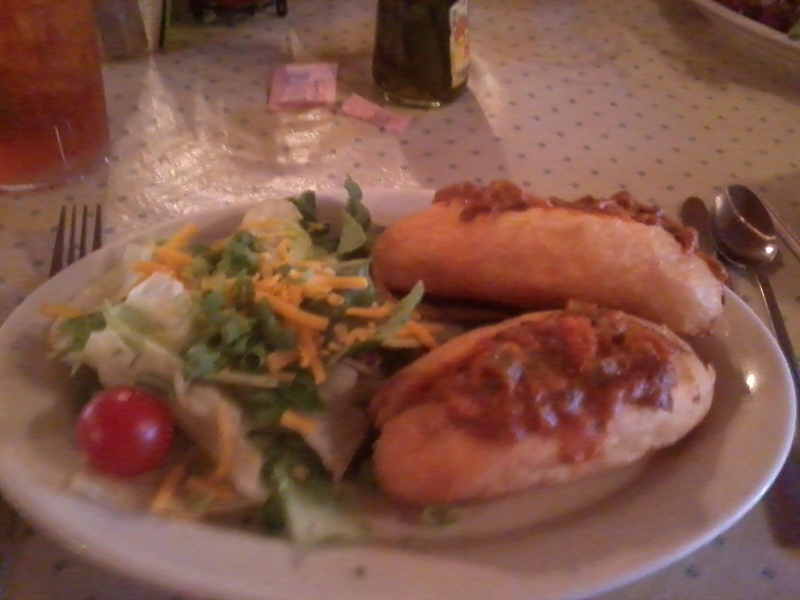 My order was two pistolettes stuffed with etouffee, which came with a house salad. Yes, that is cheese on the salad. Again, I don’t get why this is a thing now but I’m going to gloss over it. 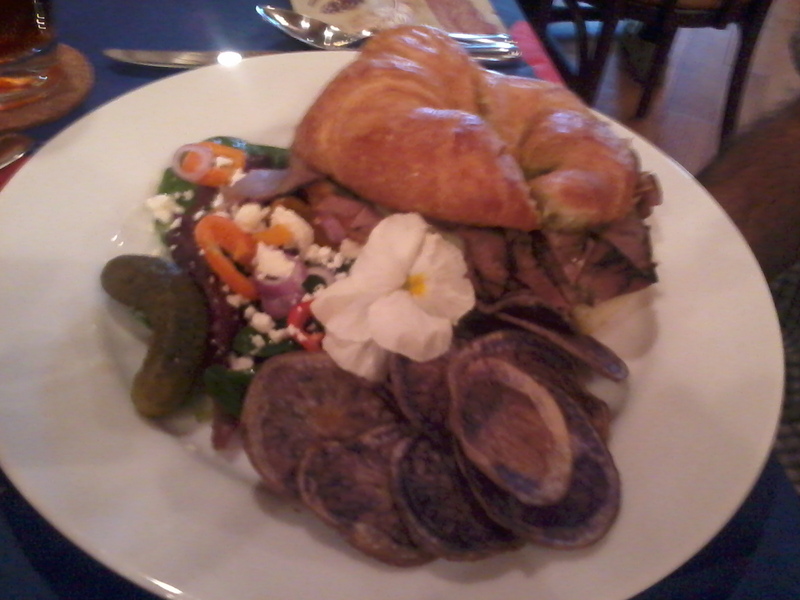 Ultimately, I didn’t eat it anyway because those other plate items were so delicious. First, the bread. It is French bread, fried (!) like a beneigh so it is slightly sweet, lightly crispy on the outside and bready on the inside. Thank goodness there were two on the plate because one was just not enough! Delicious! The etouffee was also tasty. Spicy light gravy with sweet shellfish. I also ordered a side of greens. I dug in with abandon. Great job on these. The bacon was an accent only, then the onions brought their flair and finally the greens were a burst of roughage, not overly cooked but soft enough to nibble. Well paired with the pistolettes and iced tea. 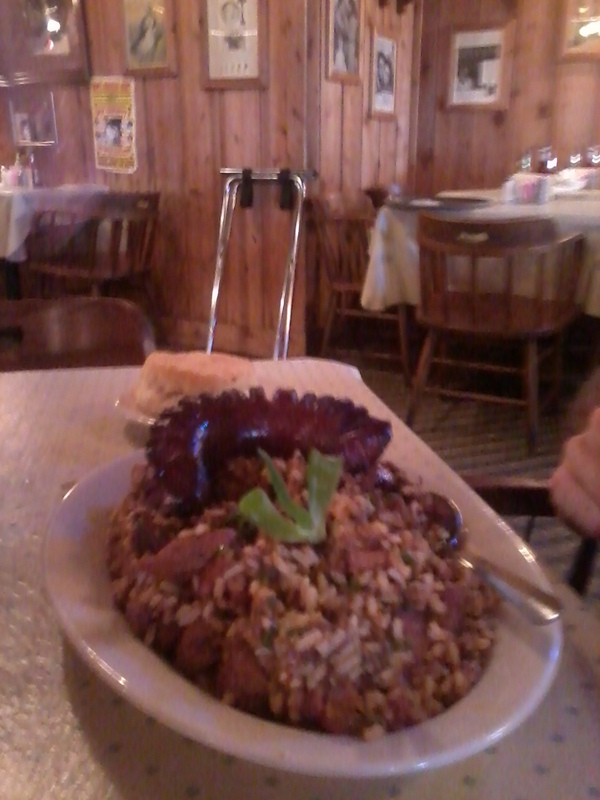 The other order at the table was boudin on a bed of red beans and rice. Being much too full to take a bite, hubs said it AMAZing. He’s kind of new to the Cajun movement and can be a bit picky but he was a big fan. The plate was cleared pretty quickly. Success! 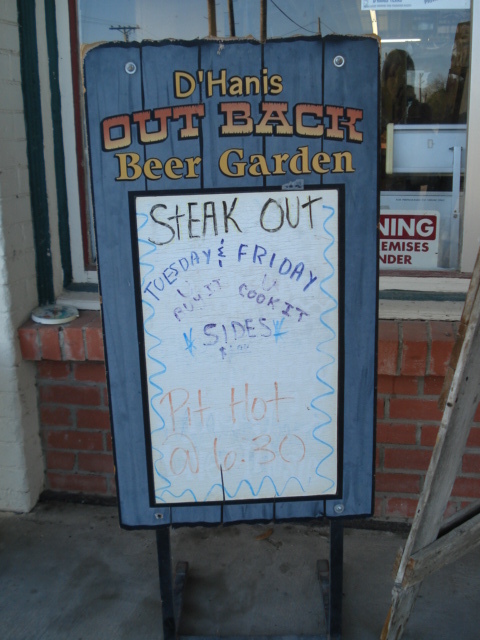 This place was very good and, quite frankly, one of your few Cajun cuisine options in the area. Thank your lucky stars they take food seriously. Stature fact: Louisiana is the only state that still refers to the Napoleonic Code in its state law. I can’t say I’ve spent much time there but recently I spent the night at a lovely bed and breakfast and even more recently, to a trip Out Back. 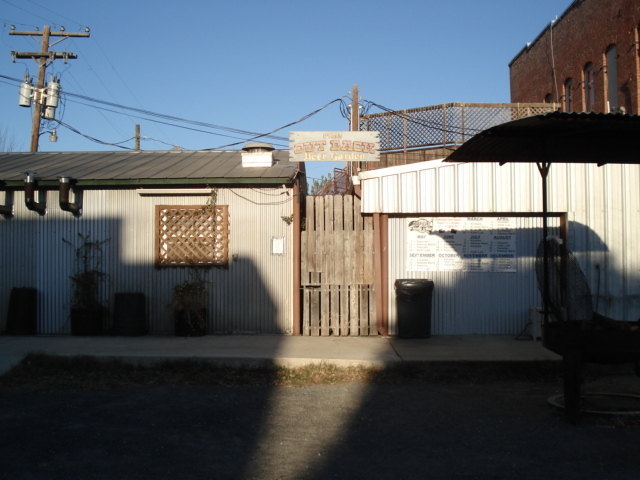 As in, behind The Country Mart to the Out Back Beer Garden. 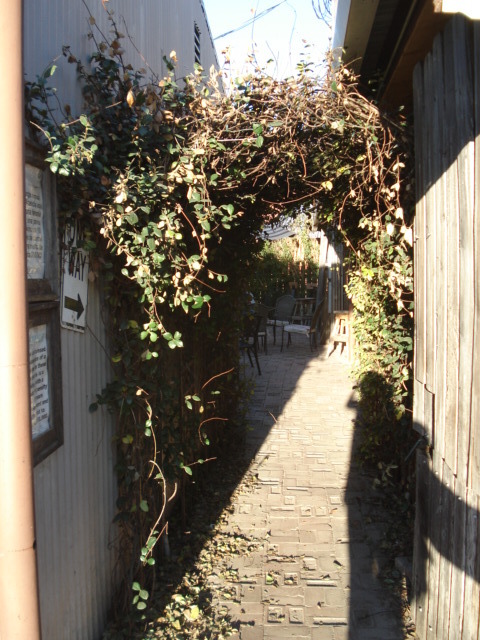 Magically, every Tuesday and Friday, a door to a secret garden opens to reveal a beauty of a place. Its meat you buy yourself and cook yourself! 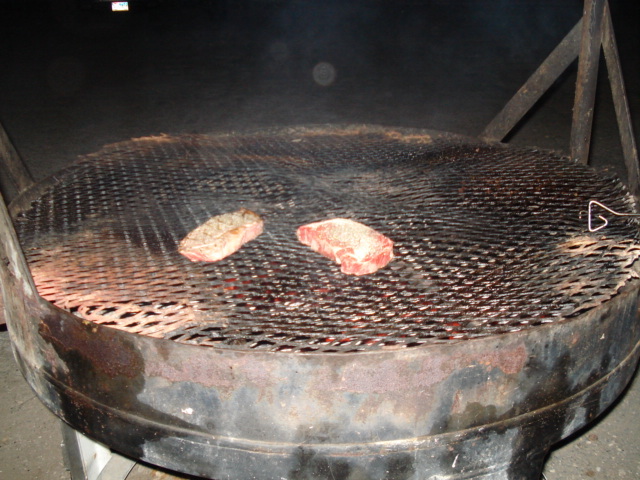 Right there on a big grill thing! What fun! Now, before you get all gung-ho and start throwing your meat around, be humble in the face of Regulars. These guys are serious. Minor seasonings are provided but they showed up with baggies of concoctions and potions so intimidating I tried to not make eye contact. 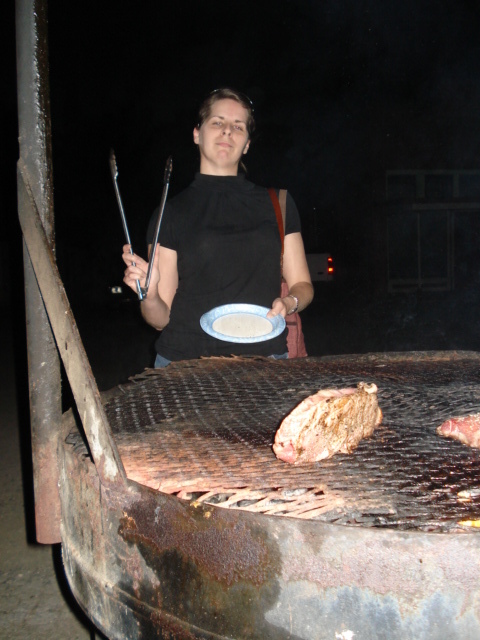 And of course, being not much of a cook and certainly no kind of griller, I waited until they were done and for the cover of darkness. Since I like mine rare, I get SUPER antsy about overcooking so I threw the slab on there, a couple of minutes each side. And by each side, I mean all four of them. Back in the garden, we drank beer and were promptly provided the side orders, which that night were potatoes, green beans and iceberg lettuce salad with ranch. These are $1.50 each, and quite frankly, you get what you pay for. The atmosphere is friendly and low-key. While the card-playing group spend a good 45 minutes trying to figure out if they knew us (maybe they did and maybe they didn’t…), we ending up chatting with some friendly folks who are in the prisoner recovery business. 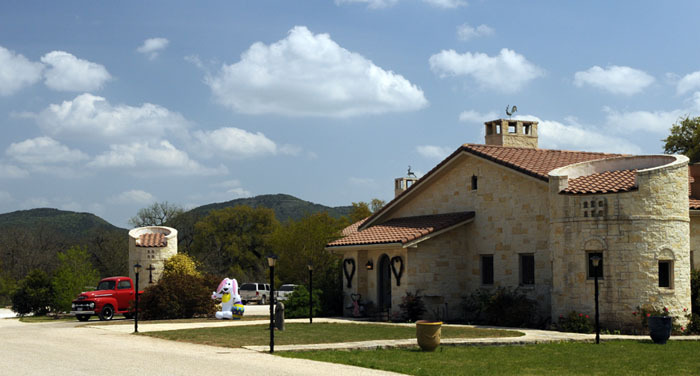 This would be a great place to take a group of friends or non-Texans for a taste of rural living. Bring your koozie and something camo if you got it. 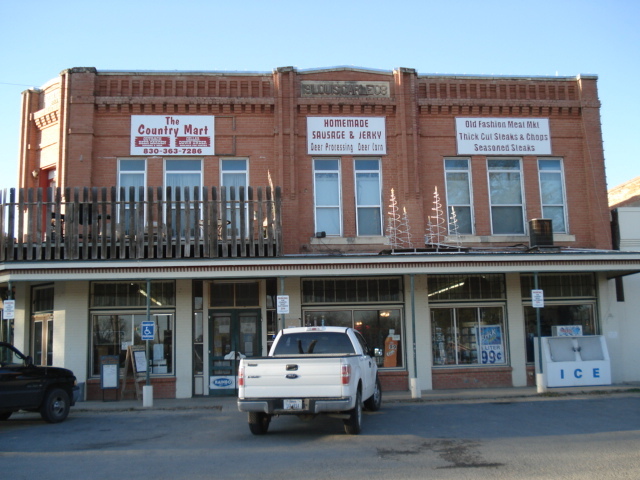 Driving good to know trivia: 42 counties in Texas are larger, in area, than Rhode Island. This weekend, the BF and I went on a breakfast quest. I say ‘weekend’ and ‘quest’ because it took both Saturday and Sunday to get it right. The idea was to steer clear of our usual two options: Bill Miller breakfast tacos or Chicago Bagels. Good breakfast in this area is not completely elusive but takes imagination sometimes. After some discussion, we tried our hand at Magnolia Pancake Haus. I say tried because we didn’t get there until 9 am and the wait was 35 minutes. 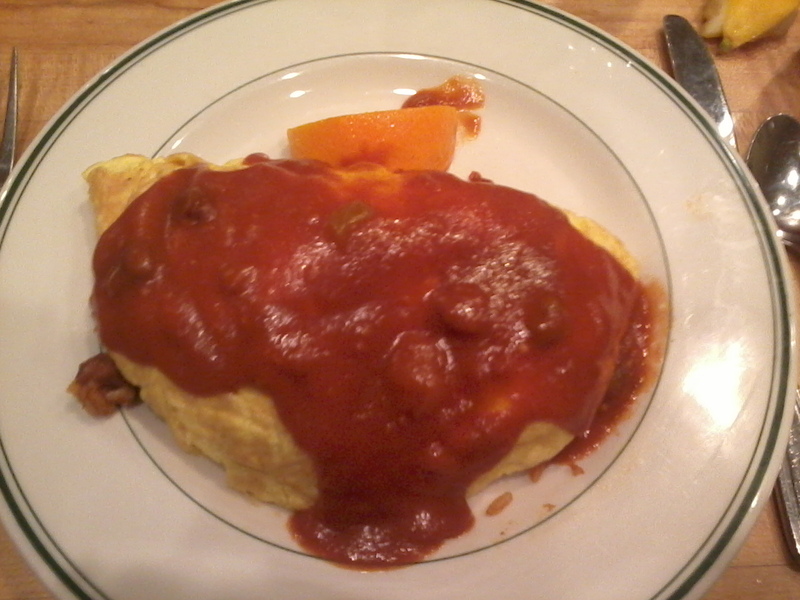 We instead went up the block to a diner which has only recently begun serving breakfast. They should stop. No further comment. So, Sunday morning, we got out of the house earlier and made it there around 8:30. There was no wait, although when we left a little after 9, all the waiting areas were filled. The cashier said Sunday is worse than Saturday. Many, many things on the menu looked awesome. I am rarely a person who craves pancakes but my two choices came down to a lemon poppy seed waffle and the Jambalaya Omelet. It was a toughie but I went with the latter which is chicken & sausage accented Creole jambalaya in a fluffy three egger, topped with mild Creole sauce. Normally it comes with Jack cheese but I omitted it. 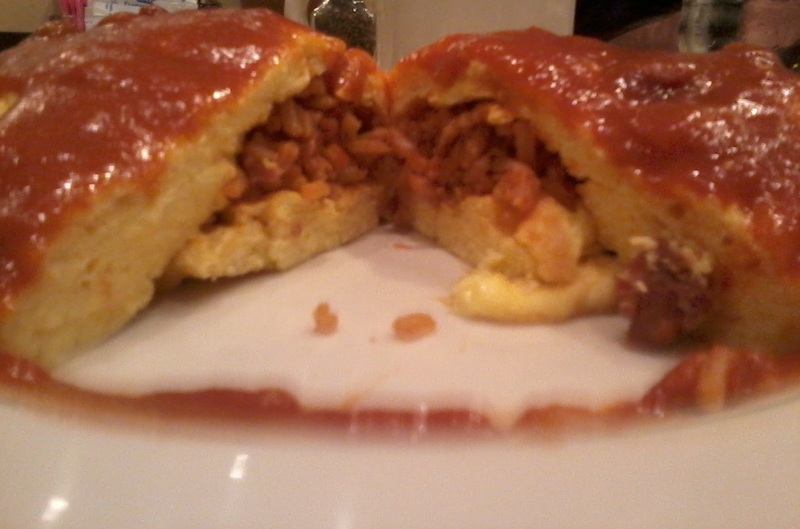 Mostly rice with more flavor, less chunks of meat, the sauce and spices melded perfectly with the egg. Although I was unable to finish the entire egg portion, the rest was consumed. 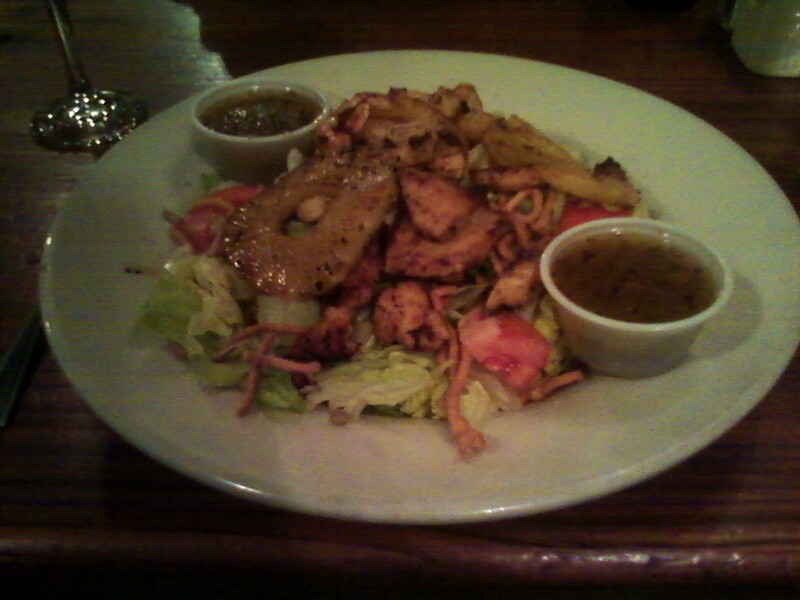 A delicious medley without the heaviness I expected. BF got the Magnolia Breakfast, which consisted of three eggs any style, Magnolia Browns and one specialty breakfast meats. There was so much that was right on this plate. First, the eggs were actually over medium and the hash browns were actually brown. This is at the very least difficult, if not impossible to come by (thanks Lyle Lovett). Secondly, the side of pancakes were awe-inspiring. Light, dual taste of a well-made batter, cooked by a dedicated fire. It is no accident this place is named after these delicacies. Please, if you go here, at least have a side of pancakes. They are perfect. The coffee was also tastastic, as was the spicy tomato juice. Service was quick and efficient but I did not feel hurried (helpful not to see the waiting area from our table). They are open 7 days a week 7:00AM to 2:00PM, breakfast is served all day, everyday and lunch is served Monday thru Saturday starting at 11:00AM. Just imagine fact: the original prototype of the Monopoly board game was circular. This morning the boyfriend and I drove an hour and a half to Utopia, via highway 90 to Sabinal then 187 to The Laurel Tree. 1) it is only open for lunch or dinner on Saturdays. Lunch seating is from 11:30am to 1:00pm and dinner seating starts at 6:30pm. Your table is reserved for the entire lunchtime or evening. This was especially nice due to our table’s close proximity to the door. With minimal in and out, dining was much more relaxed. Attire is dressy casual, and cash, checks as well as credit cards are accepted. Reservations are required. 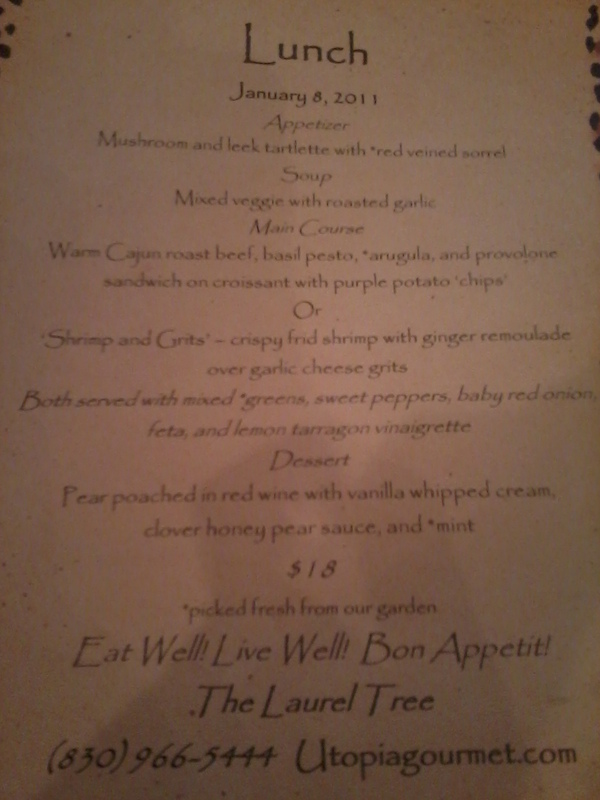 2) the menu changes weekly and highlights the European-style “guest table”. The head chef told us she selects the menu based on the fresh meats she picks up the same week (never delivered). All guests are served chef’s -choice appetizers, soup, salad and desserts but may choose between two main courses offered for the day. Evening meals include several courses for a fixed price of $35, while lunch is $18. Prices include desserts and beverages without add-on costs. Drink options included water, iced tea and peach iced tea. 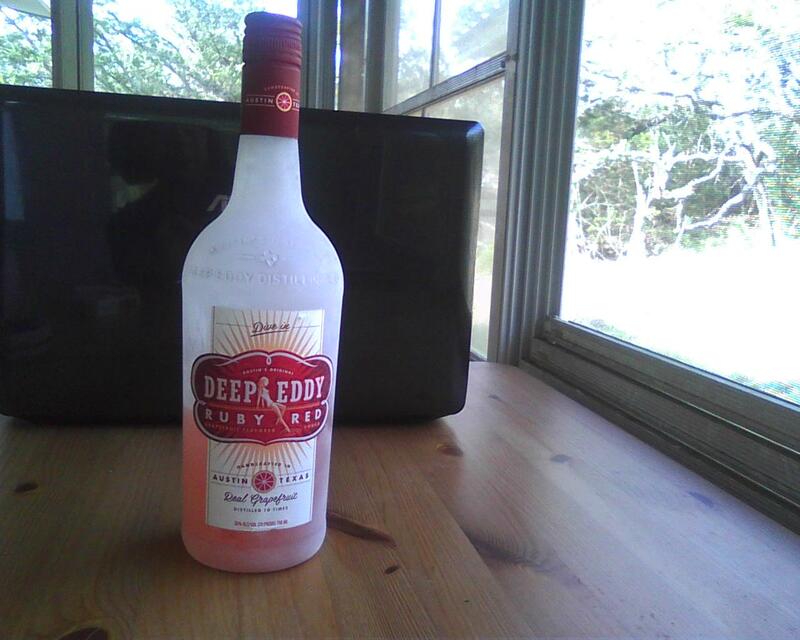 3) it’s in a dry county so no alcohol is served but you may bring your own wine. 4) the chef noted she is happy to work with patrons on restricted diets. Just call ahead and let her know. The appetizer of mushroom and leek tartlette with red veined sorrel was a nice pairing of flavors, however I found this item a bit heavy as a first course. The crust was flaky but the intensity of the fungi and cheese set a tone which was inconsistent with the rest of the meal. Nonetheless, a delicious tantalizer. Next was the soup which was made of cauliflower, broccoli, cheese and roasted garlic. I was impressed with the lightness of the taste; no one flavor was dominant which is difficult to do considering the ingredients. We discussed the potential causes of the almost gritty texture before the cauliflower was revealed. The chef noted she prefers her soups to not be silky smooth. Salad was a nice palate cleanser. Very fresh and visually appealing. The shrimp was well proportioned and delicious, although by the final crustacean, I was done with the breading. 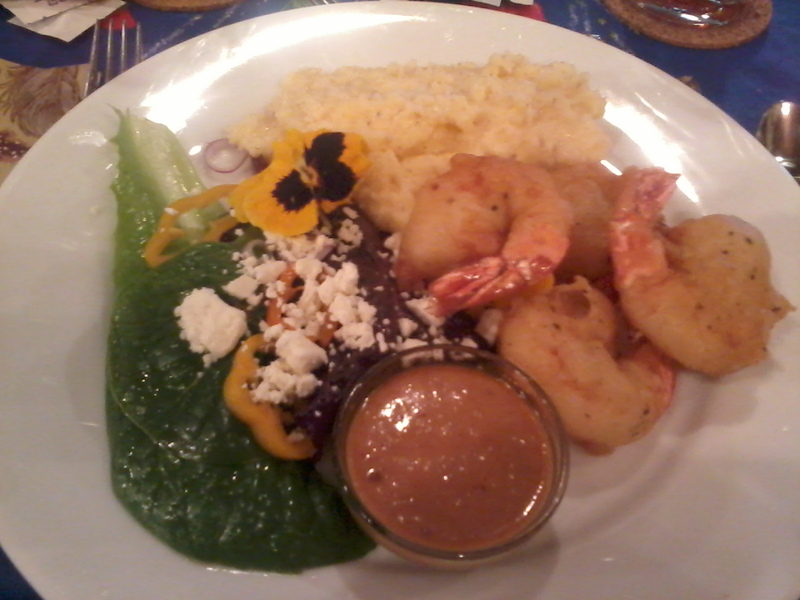 The vinaigrette was tangy and quite universal: I also tried it with the shrimp and grits with pleasing results. The grits themselves were well cooked but a bit bland for the neutrality of the plate. Neither cheesy or peppery, I think they would have benefited from a bit of zest. He was very pleased. Although I only had one bite, I could tell the pesto was wonderfully fresh and the cheese was well suited. The croissant procured an announcement all sandwiches should be on such a bread. 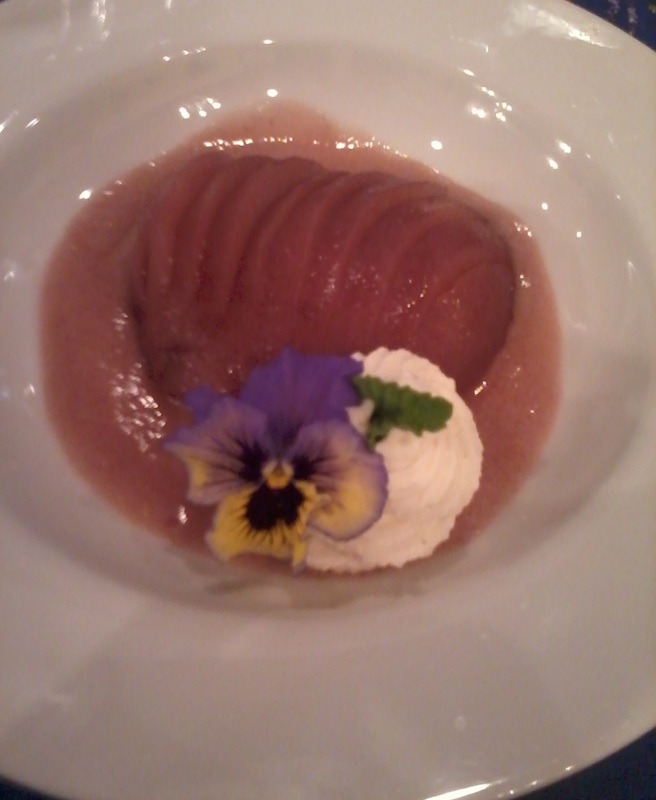 The dessert pear was a pleasingly light taste, pulled together by the vanilla whipped cream. Coffee was a nice additional flavor. My only suggestion might be to utilize a spicier red wine to enhance the flavor of the pear BUT I have no idea if this would destroy the integrity of the dish. This place produces its own herbs and greens, and is a lovely facility even on a winter’s day. Staff was friendly and unobtrusive, the decor was comforting although a tad overwhelming and the music was appropriately French but a bit loud at times. I valued the delectable food and the tranquil feel of an unhurried meal. 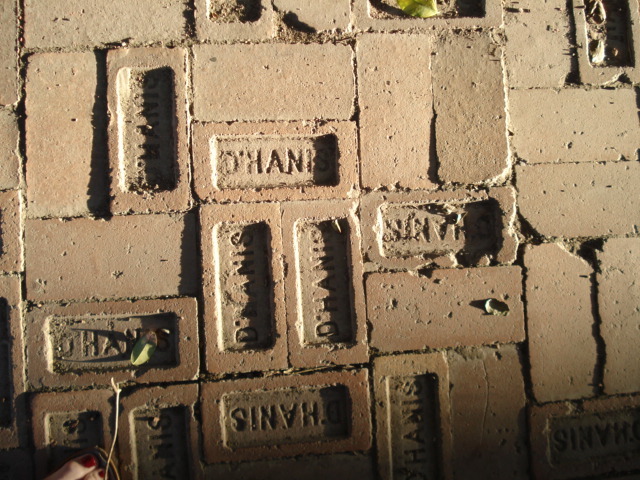 Thanks to Joan and Dan for a delightful afternoon! In related French food facts: some snails have been documented to reuse their mucus trails. 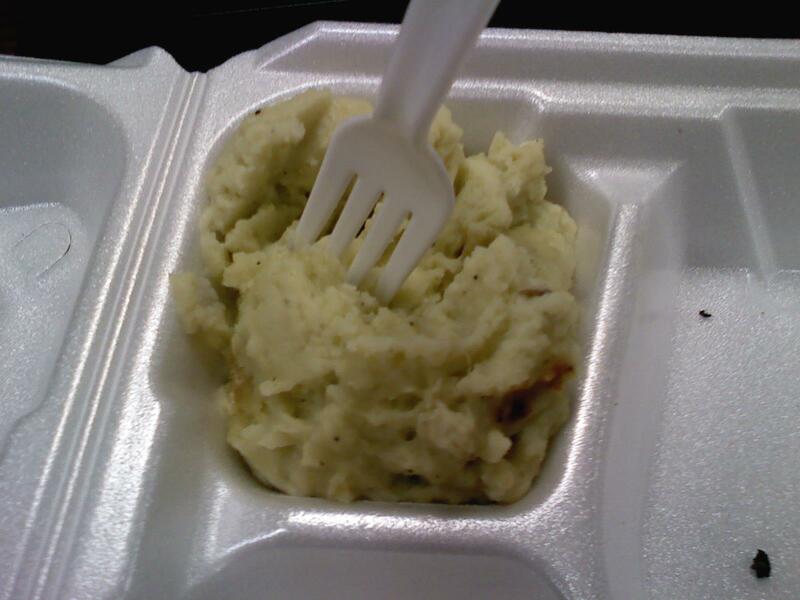 Honkytonkfoodie recommends Soul/ Asian fusion to clear up those sinus issues: Wasabi Mashed Potatoes. Really quite tasty! Thanks Jesse! Things that make you go Ew: By 70 years of age, an average person will have lost 105 pounds of skin.